I used to feature my hats far more than I do now. But I still wear them – a lot! For those of you who are new to the blog the title comes from ‘catwalk’ and is how I feel about hats, that actually you shouldn’t keep them in your closet, or hat box, instead you should be out there walking around with them on your head! 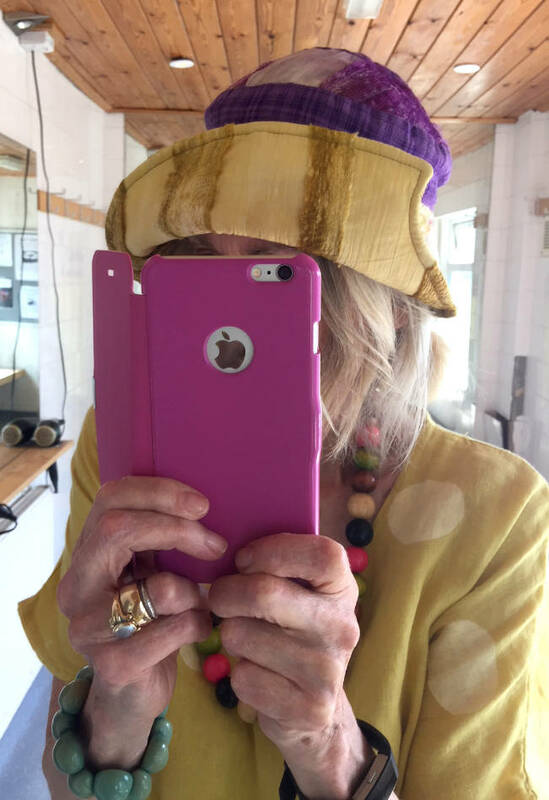 And whenever I feature a hat I also share with Judith Boyd of StyleCrone and her monthly #hatattack linkups. 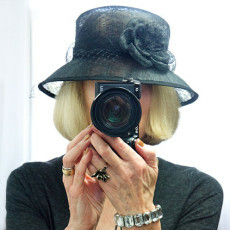 Do have a look at Judith’s blog because she is the most stunning woman who always wears a hat! You’ve seen this month’s hat before, but it is such a good summer hat, and was so essential here in the UK during our heatwave, which has broken, as they say. Big sigh of relief! Says a Brit who would always seek out the colder, northern areas of the world to explore and go to for a holiday. For example, I really do prefer Norway to Spain. It was the brightness of the constant blue skies that got to me, and it just gets boring to have the same old weather every day. We’re used to changeable weather here with a bit of sun mixed with a bit of rain, which is what the weather has returned to – good! Anyway, here’s the hat worn on a very hot day early last week. It’s a great hat because the brim can be worn both up or down. And when the brim’s down it gives good shade! Funnily enough this wonderful patchwork hat was bought new on a hat stall on the quayside in Flam, Norway. Well, there you go, Norway doesn’t only do fjords it does great hats as well! You know the one thing I’ve learnt about this dress, which is lovely in so many ways? In certain lights you can see right through it! So, when I got up to get off the bus I thought people were looking at the dress and, with its matching yellow back-pack plus the hat, I was thinking didn’t I co-ordinate well. Nope, I think, people were looking for another reason! Ah well, now I know! 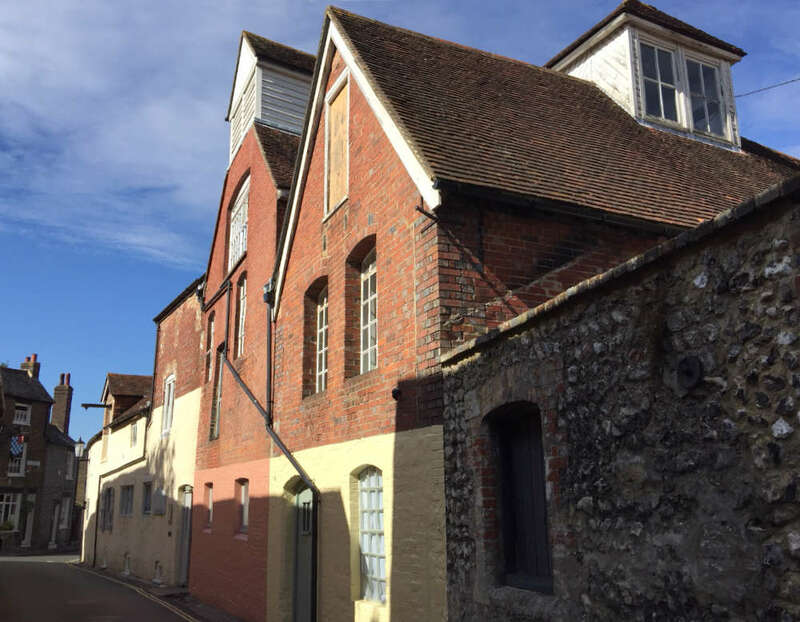 And just to say we’re having the last bit of our flat refurbed, so we’re staying at my daughter’s house in Lewes for couple of days, and for those of you who like quaint English alleyways – here’s a pic of one. P.S And sharing with the usual lovely people including Judith of Style Crone fame. Perhaps you can see amongst the icons that there’s another icon, a Readers’ Fave from Nicole’s High Latitude Style Top of the World OOTD – gosh and wow! Thank you so much Nicole for hosting this linkup. ← Something to be proud of – and a big thank you! Ah there are plenty of lovely thrift shops in Lewes! That hat suits you very well! Lewes has a number of very good thrift shops. I’m enjoying them but being good as I’ve only bought one item at £2.99, so I’m keeping to my budget! A lovely hat, so unusual and distinctive. I love the colourful necklace too, just the sort I wear. Agree with you on the weather. I like it hot, particularly when we go to Greece each year (I get vaguely insulted if it rains there!) but the varied weather is best in the UK. It’s been such bliss to sleep under the duvet again. I always feel slightly odd when I try to sleep with just a sheet – feels all wrong. I’m just like you in that I love to sleep under a duvet. And rain in Greece – oh no! It’s great that you are such a great hat lady. Ok, you are British and probable born with the gene. I used to buy hats whenever I visited the UK when I still lived in Europe. I used to sew a lot of hats when I was in graduate school. My favorite one was a pill box with dalmatian print on fake fur. No idea where it went. That pill-box hat sounds great! But although hats can be bought in the UK, really, not a lot of people wear them, and that was true even in the hot weather we had. Love that hat, well the whole outfit really, you’ll have to wear a petticoat like we all did in the dim and distant past! I made my first Charity shop purchase last week – a Dunedin vintage tweed skirt for £4 – looks hardly worn and what a surprise, I had a look at High Latitude Style and the subject was How to Wear Tweed over 40! I have taken the advice on board and am looking forward to putting it into practice in the winter months. 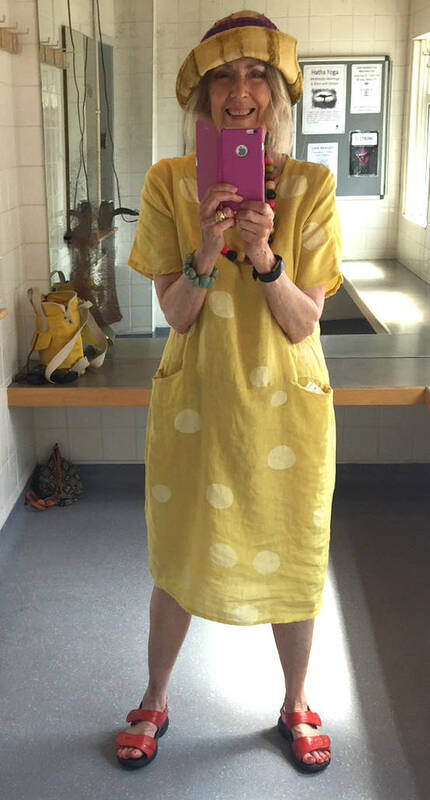 Yes, I’ll look for a slip to wear with the yellow dress (probably from M&S). So glad you found a good quality item because that’s what I’m always searching for. And well done you for finding a tweed skirt, they’re getting quite rare. I still wear petticoats/slips! They are plain and made from a viscose material so not clingy or hot. I get them on E-bay (M&S) slight seconds and they last for ages. I was given a new hat last week. Not sure if it’s navy or black and white speckled in a trilby style with a deep ribbon around and a silvery clasp. I like it but it is a bit heavy! 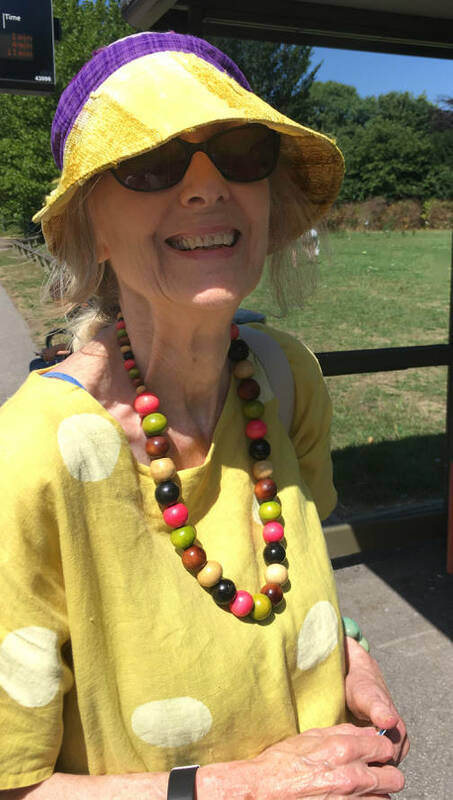 I’ve been wearing a summer hat since the heatwave started- I would have thought it’s been essential in hot sun – but very few people do. My father had skin cancer on his forehead so I’m extra careful. Oh well done getting them e-Bay, which is something I’ve never got to grips with. I’ll go look in M&S next time I’m near one. That trilby style hat sounds amazing! And I noticed also that even in the heatwave I was in the minority of people wearing a hat. More than anything I wore one to keep the sun out of my eyes. Good for you wearing a hat! The hat is fab and I really, really like your dress. Thank you so much Veronica – I love that hat! I have a summer linen dress that is slightly see through. I bought a lovely soft cool slip from Next, not online, I bought it in store. Enjoy your few days with your daughter. I do like the colours in that hat and so handy with the turn up brim and just perfect with your dress. Those on the bus were just admiring your coordination talents I’m sure. As for the stunning Judith at Style Crone , Judith seems to get more beautiful each year. Cheers, Jill. Judith is just wonderful and such a role model. And I love my hat as it’s very useful but also reminds me of the patchwork clothes I wore in the 60s!!! It was surprising to find it in Norway though – I pounced when I saw it! Hats suit you, penny. I think one either is or isn’t a hat person; I’m not. I do, however, have a black furry Cossack style one for when the weather is extremely cold. mmm….. New Zealand is not really a hat country as such. Beanies in winter, if one is going to wear a hat. The strong winds and often sideways rain, would just whip a hat off. In summer its straw beach hats with a brim, because we are blessed with the ozone-layer-hole just above our country. so we have to be extra careful, as our summers are very hot. When, of course, we head, en masse, to our lovely beaches. So, maybe hats are actually more British?